“The words Spice Islands, never fail to conjure images of languid tropical islands, exotic fruits, aromatic spices and romantic tales of intrepid seafarers and traders. This book not only reinforces these images but goes some way to explain the importance and context of the spice trade and its historical significance. “If you were to be questioned about what Zheng He, Christopher Columbus, Vasco Da Gama, Ferdinand Magellan and Francis Drake had in common, you might first answer that they were all extraordinary sailors of their time, who explored the world beyond what their own historians and geographers told them was possible. But there is a closer, more intriguing answer that ties them all together. Throw in Marco Polo, The Dutch, English and French East India Companies and numerous Portuguese, Spanish, Venetian, Arabian and other sailors and traders and what melds the lot is the story of cloves and nutmeg and their unique origin and habitat of the Spice Islands. 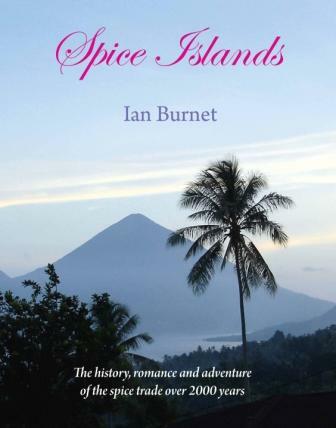 It is the story of how these noble spices came to the world to become more valuable than precious metals and gemstones that Ian Burnet sets out to relate in his 2011 published Spice Islands.